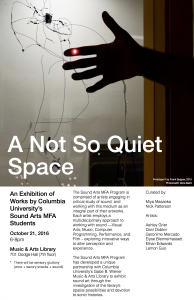 REMINDER: Sound Arts event “A Not So Quiet Space” is this Friday, 10/21, 6-8pm! Hope that you can come join us for sound art installations and performances, by students in the MFA Sound Arts program, in the Music & Arts Library on Friday 10/21, from 6-8pm. Light refreshments will be served. Thought-provoking art will be on display – come feast your ears and eyes! This entry was posted in Uncategorized on October 20, 2016 by Nick Patterson.